SolidBrush that specifies the color of the text. The rectangle to draw text in. Boolean value specifying whether to clip the text when it does not fit the bounding rectangle. Number of whitespaces to replace one tabulation character in the text with. root is the root tag. There should be one root tag in the text argument which incorporates all parts of text along with their settings. If you place some text ouside the <root></root> tags, the GdiGraphics.DrawFormattedText will throw the ArgumentException. para is a paragraph tag. All the text you want to draw should be divided into paragraphs (at least one) and each of them should be enclosed between <para> and </para> tags. Otherwise, the text will not be parsed and drawn. It supports the style attribute (see below) to specify some font and color settings of this paragraph. span is a tag intended to define a new inline area. You can use it to highlight some text inside a paragraph. These tags can be embedded in the existing <span></span> tags. It supports the style attribute too. All allowed tags are case insensitive, however, the name of every opening tag must have the same case as that of the corresponding closing tag. It means that <SpAn></SpAn> or <rOOt></rOOt> pairs will be parsed successfully, but pairs like <Para></parA> will cause an error. The style attribute and its value are case insensitive, i.e. this style setting will be applied correctly: StyLe="fOnT-faMily: CoUriEr NeW; FoNt-siZe: 18; cOlOr:RgB(100,10,10)"
Specifies a typeface name of the font. If font with specified typeface name is not found, system uses a default font (as usual it is "Arial"). Selects between normal and italic faces within a font family. Selects the weight of the font. The values 100 to 900 form an ordered sequence, where each number indicates a weight that is at least as dark as its predecessor. The keyword normal is synonymous with 400, and bold is synonymous with 700. Specifies the text color. A numerical RGB specification is used. No keywords (like red, green, white and etc) are supported. center aligns text along the center. left aligns text along the left edge. right aligns text along the right edge. justify aligns text along the left and right edges. center aligns the last line of the text along the center. left aligns the last line of the text along the left edge. right aligns the last line of the text along the right edge. justify aligns the last line of the text along the left and right edges. If the textAlignLast parameter is not specified the last line of the text will be aligned along the left edge. Specifies the space between two adjacent lines of text. &gt; - > greater than. Also this method process service characters in the specific way. It parses the tabulation character (\t in C# and vbTab in VB) as a sequence of whitespaces. Number of whitespaces to replace one tabulation character with can be specified using the tabSize parameter. The GdiGraphics.DrawFormattedText, unlike the GdiGraphics.DrawText, does not support the newline character (\n in C# and vbNewLine in VB). To draw a chunk of text from a new line you need to enclose it in <para></para> tags. 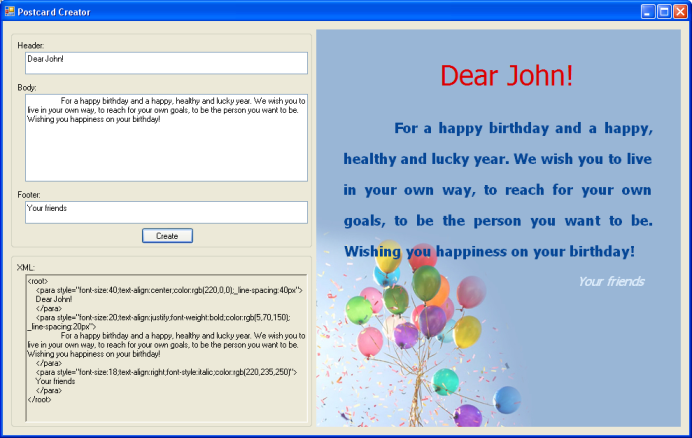 Let us examine a simple application which uses the GdiGraphics.DrawFormattedText method to create birthday postcards with user specified text. A user just fills in three text boxes and the application draws each part on a background image with predefined styles. vbNewLine & "    " & _footerTextBox.Text & vbNewLine & "    </para>" & vbNewLine & "</root>"